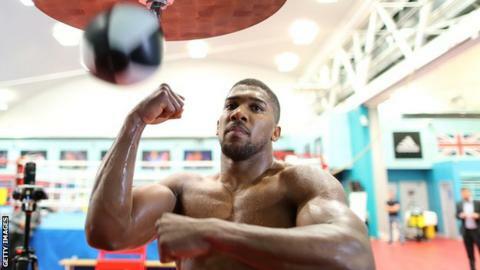 British world heavyweight champion Anthony Joshua says he is "in no rush" to fight in the United States. The 28-year-old will defend his IBF and WBA titles against Carlos Takam in front of 70,000 fans at Cardiff's Principality Stadium on 28 October. It will be the Watford-born fighter's second stadium bout, and his next move is expected to be into the lucrative American market. But Joshua wants his fans in England to still "enjoy" going to his fights. "Everyone talks about going to the States," Joshua told BBC Radio 5 live's Mike Costello. "I've heard news about going to the Middle East, I've heard news about opportunities in Africa. "From my amateur gym and people I grew up with, I give out a lot of tickets and I help a lot of people in different ways to get to the shows. I think it's great that all these little kids and their parents can come to watch a heavyweight title clash - that's why I'm not in a rush to go to the States. "If the opportunity presents itself, so be it. But the reason I'm not in a rush is that people have supported me for so long here, let them enjoy it now. "Going to America is a whole different ball game to a lot of people." Joshua will face Takam, a 36-year-old Cameroonian-Frenchman, after original opponent Kubrat Pulev withdrew because of injury. The fight will be Joshua's first since stopping Wladimir Klitschko in front of 90,000 people at Wembley Stadium in April. That saw him add the WBA title to the IBF belt he won in 2016. And Joshua said he had no thoughts of not fighting once Pulev withdrew. "I would have had way too long out of the ring and I need to keep myself active, pick up on what I've learnt from the Klitschko fight, and Takam is a good title defence. "He may not be the most popular in the UK or have the most social media followers but if you know your boxing you know he's been in with credible heavyweights. "Takam is ready and game. I've known him a long time and knew he wouldn't turn down this opportunity." He added Takam - with 35 wins from 39 fights - was not to be underestimated. "I've been preparing for a 6ft-something guy and now I'm fighting this mini-Mike Tyson/Ray Mercer/Tommy Morrison so I'm going to have to revert back to some different training techniques and get ready to dig in the trenches, trade with him and slow him down a bit," he said. "I'm going to have to learn how to deal with it."